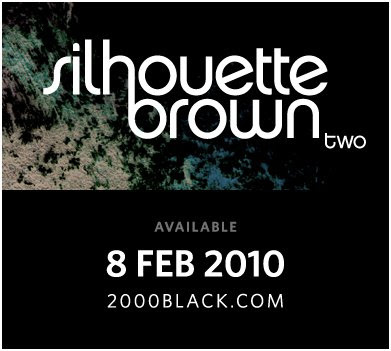 Silhouette Brown delivers its long-awaited second release "two" featuring the unmistakable vocal sounds of Philadelphia's Lady Alma. Kaidi Tatham (Agent K/Bugz In The Attic) and the co-writer/producer Bembe Segue. two also welcomes Philadelphia vocalist, Lady Alma. 20 years since the Berlin Wall fall...& the birth of Reinforced Records! 4hero - Marc Mac alongside the MC MG tearing up Club Maria in Berlin with an old skool Reinforced dj set. Still spinning the rivets 20 years down the line, R till the end, original blueprint no imitation. Ok so while we figure out what we're gonna do on the next 4hero album (2010 fingers crossed) we have a little something for you to deal with in the mean time. EXTENSIONS wasn't really planned, it just happened. On my DJ travels around Europe I kinda put the idea out to a few artists and they came back with positive vibes and interest, add a few new cats that I found through FB and Myspace and we have EXTENSIONS. EXTENSIONS is not a remix album but an extension of 4hero music in the form of cover versions, no artists got any parts or files it's just pure vibrations. Who knows maybe we can make this a series and compile part 2 with a USA vibe now that Dego spends much time in NYC. It's officially released on 19th October but i have noticed it's hit the streets already. 02. Nu Tropic – Why don’t you talk? big up the cru behind the scene. Decoy (Raw Canvas), Grace @ Lilac , PIAS, Radical PR. Marc Mac with MC MG probably spin in Paris more than London, we have a loyal following there who come to every gig, from the Twisted Funk parties we did at the Rex & Djoon to the recent gigs at Batofar & La Bellevilloise they always show us love. MaRk FoRcE & Bembe Segue on vocals) Paris got hurt Friday. "who can make your dance jam? ...4hero can! 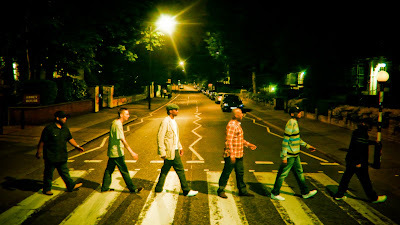 "...MC MG.
Saturday August 8th 2009, 4hero - Marc Mac & MG just finished a dj set for Alex Phountzi's 'Download This' @ The Westbury, Kilburn High Road...nowt better to do than fly round to Abbey Road and recreate a pic by the Fab 4 on the 40th anniversary of their famous album cover shot...who cares if its 3am??? Decoy said he should have brought the SLR but the pic is tough still! (L to R) - Marc Mac(4hero), Paul Adams, Carlous, Tony P, G-man, MG.
Marc Mac - In Between The Lines EP - out now! on iTunes & Other Stores, produced by Marc Mac featuring Phonte of Little Brother/Foreign Exchange, T.R.A.C, Roshin of Notes to Self, Preach & Voice. For more info visit the Omniverse Records site. look out for the full length album by T.R.A.C produced by Marc Mac later in the year!